Writing a scientific paper? Preparing for publication? Making a poster for a conference tomorrow? Let’s face it: People will skim through the body text of your paper/poster, and only look at the figures. We all love figures. They catch eyes, they deliver information effectively, they highlight your results. Figures are the star of your paper. Your job is to make them shine. We’ve talked about good and bad charts before. After making a good chart (or a figure of any kind), you will have to describe it. That’s what the legend (a.k.a caption) is for. A good legend will make or break a graphic. 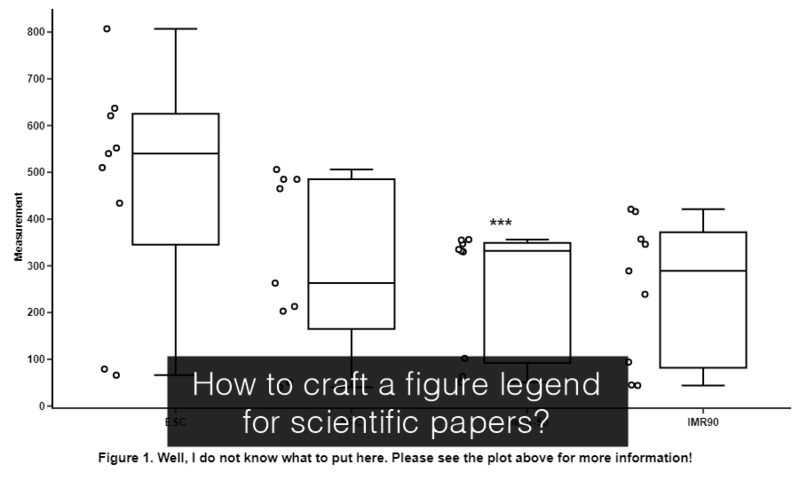 This post will give you a few tips to write and format figure legends for scientific papers. A figure should be able to stand alone. Readers want to understand it without going back and forth between the figure and the text sections. Don’t tell your readers to “See Methods” — most of them won’t look through the maze of text to search for the exact spot where you buried this piece of information. How to write a good legend that makes a figure clear as day, all by itself, in a scientific paper? The title should tell the readers “This is what this figure is about” very clearly. Use active voice, and keep it short. Make it a sentence that summarize the major result seen in the figure. Example: Hippocampal neurons derived from patients with bipolar disorder show hyperexcitability. Or, make it a phrase stating the type of analysis used. Example: Quantification of XYZ transgene expression using RT-PCR. This is where things tend to get out of hand. It is true that you should include lots of details, like assay name, antibodies used, cell type or animal model, treatments and controls, statistical tests, numbers of replicates, et cetera. The figure must be able to stand alone. You want your readers to understand it without going back to the method section. But on the other hand, you don’t have to rewrite the method section. Limit what to include in the legend to the absolute minimum that is required to understand the figure. Example: Average expression of representative genes involved in the PKA/PKC and AP firing systems revealed by RNA-seq (a) and qRT–PCR (b) analysis (normal, n=4; BD, n=6 lines). You really only need this if i) the title did not state it already, or ii) the figure has multiple panels or shows multiple results. Either way, contain the temptation to go on and on about your findings, and keep this part short and sweet. Limit it to one or a few sentences that describe the key findings that are seen in the figure. Example: Patch-clamp recording on Prox1::eGFP-expressing neurons showed spontaneous postsynaptic currents. Side note: You might not have a choice to keep the legends short. If you are publishing with Science or Nature (congratulations! ), they put a limit on body text, so a big chunk of the Methods and Results sections ends up in figure legends, hence their “signature” super long legends. A rule of thumb: Always follow the journal’s specific instructions. When possible, place all labels on the graphics. That will make it easier to read both the graphs and the legends. Tone down on abbreviations. If you must use them, make sure they are consistent with the text of the paper, and that they are common acronyms and not the obscure system that only your lab uses to manage the tubes. If there is no instruction, use the same font as the body text, and run it one size smaller. DO NOT TYPE ALL CAPS! Still overwhelmed by options? Pick one from the “People’s Choice” fonts: Arial, Helvetica, Computer Modern, or Times New Roman. Legends should match the width of the figures. Place them above a table, but below a figure (charts, graphs, images, etc). Legends should be left justified. And don’t forget the period after Figure x. Not comma, not colon. A period. An effective legend is the key to help a figure stand alone. The title should describe what the figure is about. The methods include all (and no more than) the necessary details to understand the figure without referring back to the body text. The results show the key findings as seen in the figure. Keep everything as short as possible. Avoid clutters, pick a good font, and position it right. Keep the legends consistent with the body text of the paper. And most importantly: make sure to follow the journal’s instructions.